American lawyer, and president of Gratz College; born in Philadelphia, Pa., March 9, 1821; died there July 8, 1905. He began life as a store-boy, later learned watchmaking, and afterward studied law under Benjamin Harris Brewster. After his admission to the bar (in 1851) he took an active interest in public affairs, was the candidate of the Whig party for mayor of the Northern Liberties district of Philadelphia in 1852, and, like most members of the party, was strongly opposed to slavery. Dropsie has been instrumental in the development of railways in Philadelphia; and after acting as president of the Lombard and South Street Passenger Railroad (1862-82), he became (1888) president of the Green and Coates Street Passenger Railroad, which position he still holds (1903). In 1870 he became chairman of the commission appointed by the legislature for the construction of a bridge over the Schuylkill River. Dropsie has always taken a deep interest in Jewish charitable and educational work. He has been a director of the Hebrew Fuel Society; a member of the board of "adjunta" (directors) of the Sephardic Congregation Mickvé Israel; and was one of the charter members, and for more than forty years an officer, of the Hebrew Education Society of Philadelphia, having acted as secretary, vice-president, and (twice) president. He is now (1903) an honorary life-member of the board of officers. 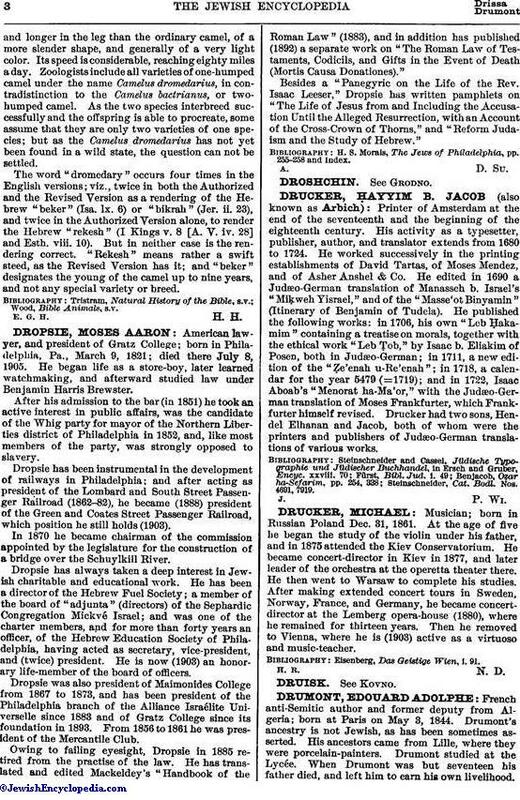 Dropsie was also president of Maimonides College from 1867 to 1873, and has been president of the Philadelphia branch of the Alliance Israélite Universelle since 1883 and of Gratz College since its foundation in 1893. From 1856 to 1861 he was president of the Mercantile Club. Owing to failing eyesight, Dropsie in 1885 retired from the practise of the law. He has translated and edited Mackeldey's "Handbook of the Roman Law " (1883), and in addition has published (1892) a separate work on "The Roman Law of Testaments, Codicils, and Gifts in the Event of Death (Mortis Causa Donationes)." Besides a "Panegyric on the Life of the Rev. Isaac Leeser," Dropsie has written pamphlets on "The Life of Jesus from and Including the Accusation Until the Alleged Resurrection, with an Account of the Cross-Crown of Thorns," and "Reform Judaism and the Study of Hebrew." H. S. Morais, The Jews of Philadelphia, pp. 255-258 and Index.